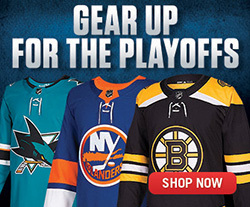 There's an image indelibly etched into the minds of hockey fans. Last June, the 6th to be precise, the mighty Ducks (not official by name but certainly by efficiency) defeated the Ottawa Senators to win the first Stanley Cup championship in franchise history. 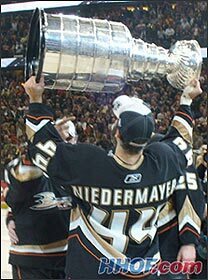 Accepting the championship trophy from NHL commissioner Gary Bettman was Scott Niedermayer, captain of the Anaheim squad, earning the right to call himself 'Stanley Cup champion' for an extraordinary fourth time. As he hoisted the Cup over his head, bringing the arena's capacity crowd to its feet in a cacophony of cheering, Scott glanced around, looking for the person to whom he would pass hockey's greatest trophy. Subconsciously, pundits had theorized who would be second to grasp the Cup  would it be veteran Teemu Selanne? Chris Pronger? J-S Giguere? The indelible image resulted from revealing the answer to the question. In an emotional moment, Scott reeled around and handed the Stanley Cup to his brother, Rob. Few will forget that moment and the affection evident between the Niedermayer brothers. There was absolutely no doubt that the Stanley Cup would spend part of its summer in Cranbrook, British Columbia, a place with which it has become quite familiar. The Cup visited the city of 20,000 in 1995 when Scott celebrated the first of his Stanley Cup victories as part of the New Jersey Devils' squad. In 1996, Jon Klemm of the Colorado Avalanche took the Stanley Cup home to Cranbrook. In 1997 and 1998, Cranbrook-born Steve Yzerman captained the Detroit Red Wings to Stanley Cup victories. Brad Lukowich of the Dallas Stars took the Stanley Cup to his hometown of Cranbrook in 1999. In 2000, Scott Niedermayer returned home with the Stanley Cup for a second time. Jon Klemm of the Avalanche returned to Cranbrook with the Stanley Cup for a second time in 2001. Cranbrook's Steve Yzerman won the Stanley Cup for a third time with the Red Wings in 2002. In 2003, Scott Niedermayer arrived in Cranbrook after winning the Stanley Cup for a third time with the Devils. Brad Lukowich returned to Cranbrook with the Stanley Cup again in 2004, this time as a member of the Tampa Bay Lightning. It's curious, but no matter how many times a town hosts a Stanley Cup celebration, the feeling never gets tired. The plane carrying the Stanley Cup touched down in Cranbrook at 7:30 on the evening of Sunday, August 26. Greeting hockey's historic trophy were newlyweds Rob and Jessica Niedermayer, who earlier this summer had married and spent their honeymoon in Fiji. Jessica is the daughter of Barney Bentall, leader of the Legendary Hearts, who enjoyed musical success with songs like 'Something to Live For' back in 1987. Rob Niedermayer hangs out with Stanley at his brother's ranch in Cranbrook, British Columbia. Rob took the Stanley Cup to his ranch, situated in an extraordinary location near Norbury Lake at the base of a nearby mountain range known as The Steeples. After visiting his friend Albert Comfort at a neighbouring ranch, the Cup was taken to the lake for photographs. Deer, usually timid at the sight of humans, grazed casually nearby, unaware of the significance of the big silver thing being carried about. One of the principal goals of the visit to Cranbrook for Rob was to get photographs with the Stanley Cup at the top of Bull Mountain, which can be seen from his home. Scott had done similar shots on an earlier visit and they are among the most spectacular shots ever taken with the Lord Stanley's legacy. That evening, Rob and Jessica invited a third party into their bedroom for a special night. They slept with the Stanley Cup. 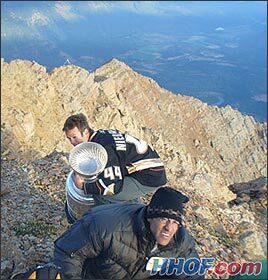 After being dropped off via helicopter near the peak of Bull Mountain, brothers Rob (left) and Scott (right) Niedermayer prepare for their dream photo with the Stanley Cup atop a glacier. The sun rose on Cranbrook Monday, August 27 with a full itinerary planned for the Stanley Cup. To begin the day, one of Rob's horses dined on oats eaten out of the Stanley Cup. 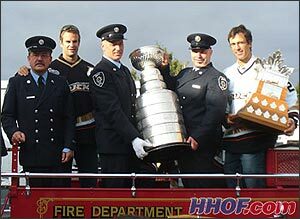 Then, more pictures were taken with the Cup around the Niedermayer ranch. The tour began with a Monday morning visit to the office of Dr. Robert Niedermayer, father to the two Stanley Cup champions. Scott met his Dad and brother there, joining the activities for the day. After a stop at the local police station, the boys dropped into Stefan's Hair Studio, where their mother, Carol, gets her hair done. Rob and Scott's Mom had heard that Stefan Zhukrovsky was not going to be able to attend the reception for the boys that day, so they surprised him and his 12-year-old son Conner by bringing the Stanley Cup to them. It was a day for streaks and shrieks at Stefan's that morning! At noon, the Niedermayers arrived at the Cranbrook RecPlex. They made their entrance on a truck that circled the perimeter of the rink. With well over a thousand people looking on, Mayor Ross Priest declared August 27 Rob and Scott Niedermayer Day in Cranbrook. The boys were greeted by a non-stop phalanx of light as fans took pictures of the local boys with the Stanley Cup. The media attended in abundance, firstly to celebrate a momentous occasion and secondly, hoping to discover whether Scott intended to play hockey in 2007-08. Scott did offer a clue: "I'm not tired of the question; I just wish someone would give me the answer!" Rob laughed, adding, "I've still got a couple of weeks left to try to talk him out of retirement." A later press conference confirmed that although Scott had not yet decided whether to retire, he would not be attending Anaheim's training camp. The boys answered a number of questions about the significance of returning home with the Stanley Cup. "We heard from a lot of people that they really enjoyed watching this Stanley Cup final with Rob and I playing," Scott mentioned. Rob smiled and punctuated his elation in winning the Cup with his brother. "I don't think anything in my career will ever top Scott passing me the Stanley Cup!" Some local youngsters, clearly idolizing the Niedermayers, asked for some hockey advice. Rob started by insisting, "Make sure you have fun and remember, it's a game." Scott added, "In hockey, hard work is definitely rewarded." The brothers posed for photos with the Stanley Cup, charging a fee that was donated entirely to Alyssa Bartraw, a beautiful little six-year-old girl from Cranbrook who was diagnosed with leukemia in May 2006 and is undergoing treatment at the Alberta Childrens' Hospital. They posed for at least a thousand photos, and easily signed that number again. $5,000 was raised through the efforts of the Cranbrook-based Ducks. It was an exhausting four hours from noon to 4:00, and the boys were quite pleased to return to Rob's ranch for a barbecue, with 50 close friends enjoying a feast of hamburgers, corn on the cob and rhubarb-strawberry pie. Satiated, the group posed for an outstanding photo together in a field at sundown with the mountains in the background. It's almost exactly an hour's drive from Cranbrook east to Fernie, BC, where Scott is considering putting up a residence. The Niedermayer boys took the Stanley Cup to Fernie on Tuesday, August 28. The official reception began with Scott and Rob riding on a vintage firetruck as thousands of local residents lined the streets, hollering and waving as the victors rode by with the Stanley Cup. The route ended at Fernie City Hall. After a few pictures on the front lawn, the boys signed autographs again for several hours, with proceeds benefiting several children's groups. Lunch was completed, and the Niedermayers took the Stanley Cup by ski lift to the top of a nearby mountain at the Fernie Alpine Resort for more photographs. Scott and his family took the Stanley Cup to Elk River, an exquisite natural area of the Kootenays not far from Fernie. As Scott and his wife Lisa and their boys, Logan, Jackson and Josh were having pictures taken, a conservation officer warned them that grizzly bears had been spotted in the area, and advised them to leave the area, which Scott and his family did, doing a head count as they climbed back into the vehicle. Friends of Rob's had been unable to arrive in Cranbrook on Monday for the public reception, so flew in from Penticton on Tuesday at Rob's invitation and had their pictures taken with the Stanley Cup in a local park. The brothers then took the Cup to a local taxidermist's shop and to The Players Bench, a sporting goods store. The time had come for Rob to realize his Stanley Cup dream. It was time for the mountain shot! The weather was perfect and the plans began to unfold. This was definitely the anticipated highlight of the Niedermayers' time with the Stanley Cup. A helicopter lifted Rob, Scott and a photographer to a glacier near the peak of Bull Mountain. Then, they were carried to the very top, and with the helicopter hovering overhead, first lowered Rob, then Scott, onto the peak of the mountain. There was barely enough room to manoeuvre, but with the helicopter suspended just above them, the Stanley Cup was gingerly passed down to them. Meanwhile, a second helicopter carrying Jessica, Lisa and a videographer captured the moment as the Brothers Niedermayer collaborated on thrusting the Stanley Cup over their heads while standing high above the rest of the world. Nervous but exhilarated beyond comprehension, Scott and Rob had achieved the dream of winning a Stanley Cup championship together, and now, had literally been on top of the world, again, together. After all had settled their heart rates to near-normalcy, they ended their day in Finnegan's Wake, a Cranbrook bar owned by Brad Lukowich. Wednesday, August 29 was a non-stop merry-go-round of visits for Rob and Scott. The Golden Arches of McDonald's was the first stop for the silver gleam of the Stanley Cup. Next was Tim-BR Mart. Ensuing visits were jeopardized when Rob noticed that his truck had a flat tire. "No worries," laughed Scott. "We'll take my truck." Binky's Auto Detail Shop was next, followed in rapid order by Gerick Sports, Rob's barber, their Mom's house, World's Gym, East Kootenay Regional Hospital, the Canadian Railway Museum, the Royal Bank, Joseph Creek Retirement Community, a few car dealerships and then lunch at Quizno's. The sandwiches were barely finished when they jumped back into Scott's truck for a visit to the rookies trying, working out back at the Cranbrook RecPlex in hopes of cracking the line-up of the Kootenay Ice. After giving the Western Hockey League hopefuls something to aim for, the brothers were off to the Wildstone Sales and Discovery Centre, followed by the firehall then back to their mother's house. 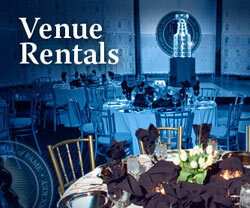 There, they got cleaned up for a further Stanley Cup celebration, this time, at the Colombo Hall. Four Hundred guests were in attendance, and as the Niedermayers entered, they were preceded by the skirl of bagpipes, with those in attendance standing in unison to welcome the local heroes of hockey. A few speeches were made before the invited tucked into a feast of food. In his speech, Rob amused the guests by mentioning, "Hey, I couldn't beat Scott so I had to get him to join us!" A sensational three-day celebration in the communities of Cranbrook and Fernie evaporated as quickly as ice in summer. The visits, all of the many made by the Niedermayers, passed by in a blur. "You want to share it with the people that helped you along the way," shrugged Rob. "Without your family and without your community, we wouldn't be here." Scott added, "It feels good when you make people happy, when you do something that makes them smile." 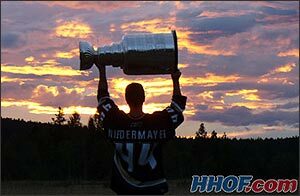 Rob Niedermayer hoists the Cup as a breathtaking sunset concludes his thrilling three-day celebration in Cranbrook and Fernie, British Columbia. Teammates and friends call Rob and Scott Niedermayer 'Norm and Cliff' after the inseparable friends on Cheers. During this past hockey season, the brothers drove to the rink together every single day they were at home. This summer, their families spent large amounts of time together back home in British Columbia. Later this month, the Stanley Cup will be engraved with all those names that made possible the Anaheim Ducks' historic victory. It is only fitting, therefore, that the names 'Rob Niedermayer' and 'Scott Niedermayer' will be etched into the surface of the Stanley Cup, together for all time. "I'm sure glad it turned out the way it did," concluded Rob. "It just means that much more to have won it (the Stanley Cup) together." Friday, the Stanley Cup Journal ventures into Ottawa as Sean O'Donnell takes the Cup into enemy territory, Y'all come back now, hear?